Despite the concerns shown by the Supreme Court, NGT, Central Government, Delhi Government and the various administrative agencies, the pollution levels in Delhi NCR remain to be at a critical level. The PM 10 and PM 2.5 levels have been consistently above 300 for many days and the PM 10 hit its peak to 999 around Diwali in many parts of Delhi. From very poor to severe to hazardous, the citizens of Delhi and NCR are somehow coping up with the situation and only some realising the long term damage this air may be causing to them. The Delhi Environment Pollution (Prevention & Control) Authority also warned that if the air quality in Delhi continues to deteriorate then it would impose a complete ban on the use of non-CNG vehicles. 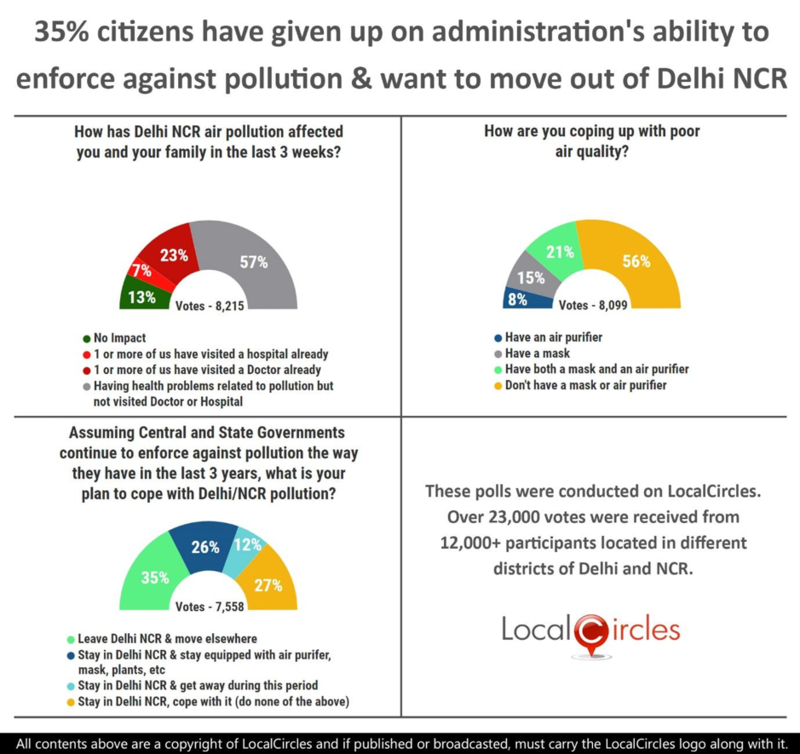 LocalCircles conducted a 3-poll survey to understand how the pollution is affecting the citizens of Delhi NCR and what they are doing to cope with it. 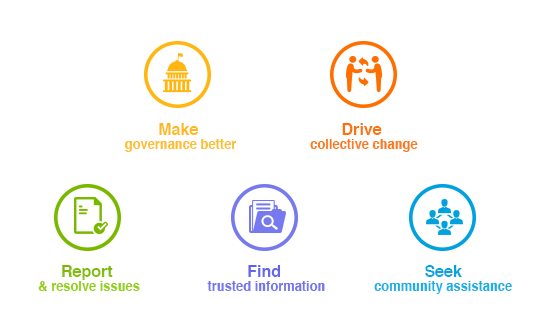 The survey received over 23,000 votes from 12,000+ unique citizens living in Delhi, Gurgaon, Noida, Faridabad and Ghaziabad. The first question asked that assuming central and state governments continue to enforce against pollution the way they have in the last 3 years, what will their plan be to come with the Delhi/NCR pollution. Shockingly, 35% said they would like to leave Delhi NCR and move somewhere else. 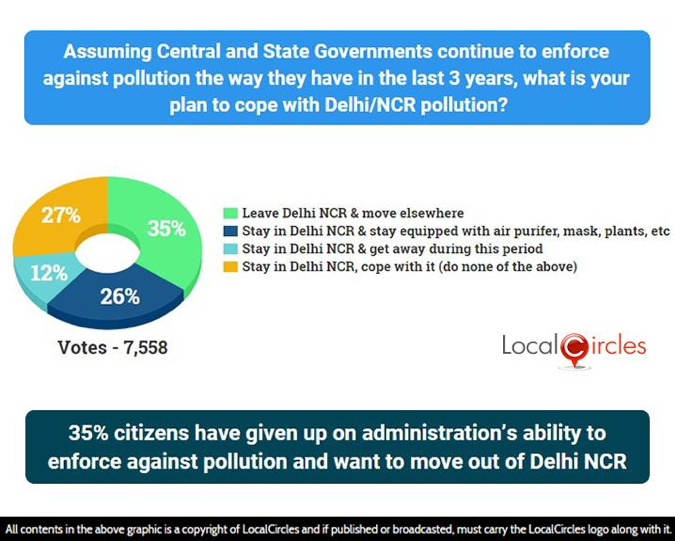 26% said they will stay in Delhi NCR and equip themselves with things like air purifier, masks, more plants etc. 12% said they would stay in Delhi NCR but would get away during this period. The last 27% said that they have no option to stay in the city and cope with the pollution. High prices of masks and air purifiers have also caused frustration among people. Many companies have launched masks but the prices of the good ones which give protection against PM 2.5 are on the higher side. Air purifiers also range from Rs. 10,000 to Rs. 25,000 taking them out of the reach of a large middle-class population. 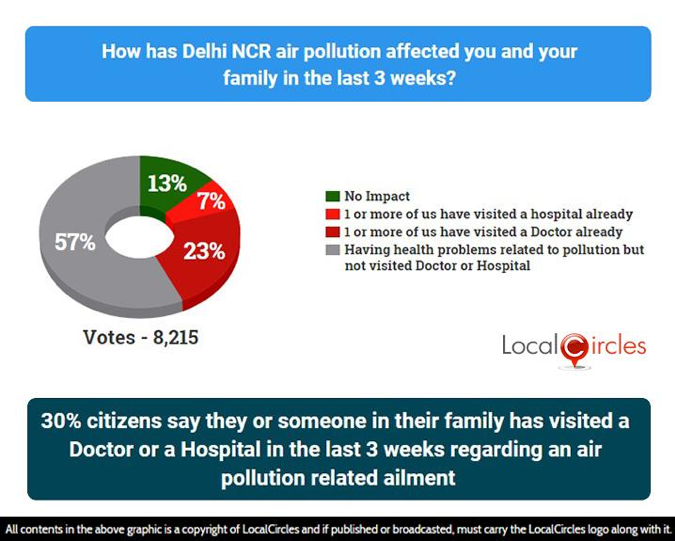 On the question on how the Delhi NCR air pollution has affected them and their family in the last 3 weeks, the results show a worrisome picture. 57% said they are having health issues related to pollution but have not visited the doctor or a hospital yet. 23% said 1 or more of their family members have already visited a doctor, while 7% said 1 or more of their family members have already visited a hospital. A meagre 13% said pollution has had no impact on them or their family. 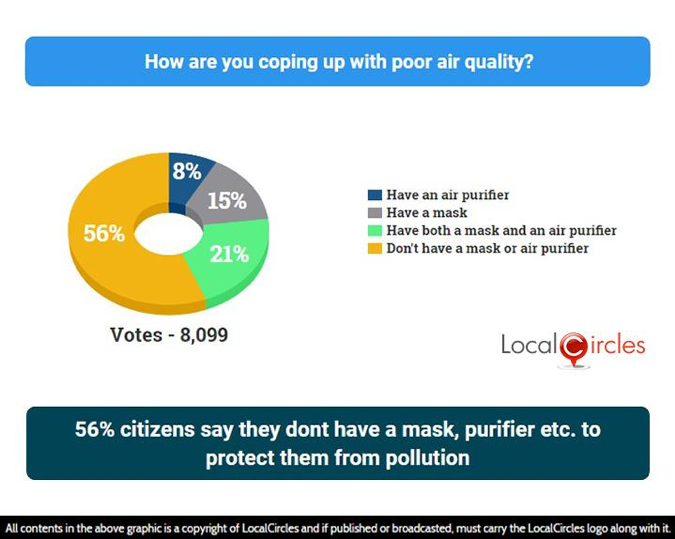 In the final poll, 56% citizens said that they do not have a mask or a air purifier to protect themselves for the Delhi pollution. 8% said they have an air purifier while 15% said they have a mask. 21% have both mask and air purifier at home. EPCA and country’s pollution watchdog CPCB have continued to take some actions to control the level of pollution like limiting the entry of heavy vehicles in the city limits and putting a ban on construction activities during day time, but the severe state of the environment has not shown much respite. Looks like the Government will have to move fast and take some very strict policy actions and enforcement to control the pollution before the citizenry gives up completely on its ability to ensure breathable air in the country’s capital.